The World of Warcraft: Cataclysm alpha test is under way, and with it comes a whopping horde of leaked screenshots of the new, ruined world of Azeroth. At some point, you need to wonder why Blizzard keeps doing its Friends & Family Alpha tests. The notoriously-secretive developer has a large enough support team for WoW to practically do the tests all on their own, and the internal teams are far better at keeping mum. The moment the test gets opened to friends and family, though? Well, a full leak of the alpha client isn't far behind. What must be annoying for Blizzard, though, is great news for us. Somebody at MMO Champion is either in the alpha test, knows someone who is, or has access to the client, because they've posted a metric crapton (or would that just be a craptonne?) of screenshots of the post-Cataclysm world. Frankly put: This looks fantastic. An almost-decade-old engine has no right to look so good, and it just goes to show how Blizzard's art direction is second to none. These images have instilled in me an anticipation for Cataclysm (or at least the press beta) that's honestly surprising. There's so much here that I'd need ten news posts to discuss it all - let alone the new zones - so here are some quick items that made me go "Wait, whoa." -As we learned at BlizzCon, the Thousand Needles have been flooded, which means that the raceway in the Shimmering Flats is now underwater. It's been replaced by Fizzle Pozzik's Speedbarge, though "speed" and "barge" are not traditionally two words used together. A floating mini-raceway, perhaps? -Ashenvale has suffered its share of natural changes, but also some man-made (well, orc-made) changes as well: Zoram'gar Outpost is a bit beefier than the last time we saw it. 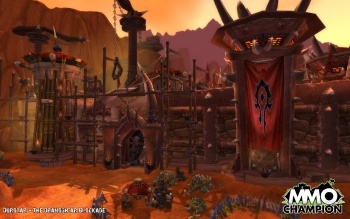 -In fact, with Garrosh Hellscream as Warchief, the Horde has been gearing for war. You can see a defensive position outside Orgrimmar here to the right, but inside the city is just as iron-clad and ominous as the exterior. That is, excepting the new Goblin area, where they've set up beach umbrellas. There's also what looks to be a new gate leading directly north into Azshara, which is being retooled as an early Goblin zone. -The Goblins have been hard at work reforming Azshara, with quarries and what looks like an elevated highway. Perhaps the most surprising Goblin addition of all, however, is a golf course, part of "Gallywix Pleasure Palace." I wonder if there's a minigolf daily quest. -A good portion of Mount Hyjal is now blackened by ash and lava as Ragnaros makes his move (and the Throne of Flame looks damn cool) but Nordrassil, the former World Tree, seems as peaceful and idyllic as ever. -Orgrimmar may have changed, but Stormwind still looks pretty much the same, though now we get to see what it looks like from above. Good to see that in this world of changes, some things remain familiar, with absolutely nothing having changed due to the Cataclysm. Oh wait. You can see the larger images - and tons more - over at MMO Champion, along with some datamined models and abilities (including one that suggests we'll be fighting both resurrected children of Deathwing - Onyxia and Nefarian - at the same time). If you play or have ever played WoW, it's well worth your time. Though if you've since quit the game, you might want to pass it up. Almost everyone I know who's seen these has felt a very strong urge to reactivate their account - get out while you still can!